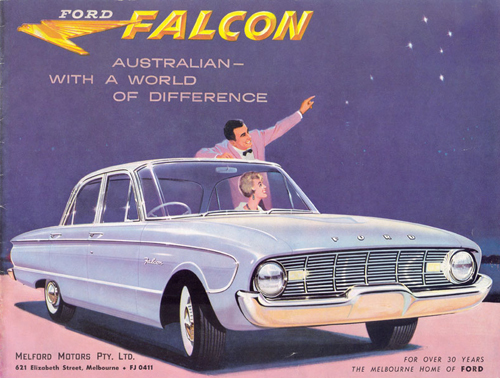 While the North American Ford Falcon quietly disappeared in 1970, its Australian counterpart went on to a long and eventful career that continues to this day. This week, we take a look at the birth of the Australian Ford Falcon, including the 1960-1972 XK, XL, XM, XP, XR, XT, XW, and XY Falcon, the Falcon GT, and the beginnings of a storied racing career. The history of Ford in Australia begins not down under, but rather in the Canadian town of Walkerville, Ontario, now part of Windsor. In January 1904, Gordon McGregor, the president of the Walkerville Wagon Company, decided that his firm should enter the emerging automotive business. Seeking a partner, McGregor approached Henry Ford, whose new Ford Motor Company had been incorporated the previous year. That summer, they established the jointly owned Ford Motor Company of Canada, which held the rights to manufacture and distribute Ford cars and trucks in Canada and other British territories (excepting Ireland and Great Britain itself). Production of Canadian Fords began that October, some for local sale, some for export to markets like South Africa, New Zealand, and Australia. Australia soon emerged as Ford of Canada’s largest export market, with the first car arriving in Sydney in 1904. Although a regional sales office was established in Melbourne in 1909, Ford engaged separate distributors in each Australian state, beginning with Victoria’s Tarrant Motor Company. In the early days, each distributor generally dealt directly with the Canadian headquarters, and it was not until March 1925 that Ford of Canada established a formal Australian subsidiary, Ford Motor Company of Australia Ltd., in Geelong, Victoria. Although their running gear was manufactured in Canada, the bodies of many early Australian Fords were made locally by coachbuilders like T.J. Richards and Sons or Holden’s Motor Body Builders (which merged with GM Motors Australia to form GM-Holden in 1931). By the twenties, Ford was importing complete knock down (CKD) kits for local assembly, first by outside agencies, later in Ford’s own factories in Geelong, Adelaide, and Brisbane; Ford was the first major automaker to have its own assembly facilities in Australia. As we discussed in our earlier article on the Ranchero, in the mid-thirties, Ford Australia also developed a unique body style, the coupe-utility, or “ute,” which became an Australian staple. The motorization of Australia was a gradual process. According to the Commonwealth Bureau of Census and Statistics, total car and truck registrations in 1924 numbered only 221,285, compared to more than 650,000 in Great Britain and over 15 million in the United States. By 1939, total vehicle registrations had grown to around 820,000, with new car and truck registrations for the 1938 fiscal year totaling about 76,500. By the outbreak of World War II, however, Australia still had fewer than 130 motor vehicles for every 1,000 people, compared to about 243 vehicles per 1,000 people in the United States. Only about 25% of Australian households owned an automobile. While there had been a few small-scale efforts to develop a truly Australian car going back to at least 1899, it was not until the late thirties that the prospect of locally manufacturing complete automobiles began to seem economically viable. Earlier in the decade, the Australian government had imposed new tariffs and import restrictions intended to spur local production of automotive components and replacement parts. 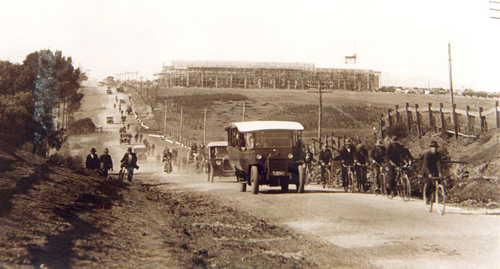 In 1939 and 1940, those efforts culminated in controversial legislation that would have given Australian Consolidated Industries Ltd. (ACI) an effective monopoly on native automobile manufacture. The ACI deal subsequently collapsed in a flurry of debate over its constitutionality, but by 1944, the Labor government of Prime Minister John Curtin was looking for ways to bolster the Commonwealth’s industrial base, hoping to maintain wartime levels of production and employment after the conflict ended. In October 1944, the Department of Post-War Reconstruction’s Second Industry Commission invited major automakers to submit proposals for postwar manufacture of a truly Australian car. The Australian government eventually received proposals from five automakers: the Nuffield Organization (Morris/Wolseley/MG), Standard-Triumph, Chrysler, GM-Holden, and Ford. Ford’s plan called for a complete line of V8-powered cars and trucks based on the 1942 Mercury, a proposal that was apparently more grandiose than the Cabinet had in mind. The Second Industry Commission had determined that local production would only be sustainable with an annual production volume of at least 20,000 units, which would require something more affordable and fuel-efficient than the big Fords. Ford managing director Hubert French may also have erred by asking for AU£850,000 (US$1.7 million) for tooling costs — more than the government was prepared to invest. Subsequent negotiations failed to produce a mutually agreeable figure and the Cabinet finally accepted a proposal from GM-Holden for a more modest six-cylinder car, based on a prototype previously developed (and discarded) in Detroit. The result was the Australian-made Holden 48/215, launched in November 1948 in a ceremony attended by Prime Minister Ben Chifley. The new Holden quite overshadowed Ford’s lineup of locally assembled imports, which at the time included the English Ford Anglia, Prefect, and Pilot as well as a smattering of bigger Canadian Ford V8s. Offering an appealing combination of size, performance, economy, and patriotic pride, the 48/215 quickly won the affection of a generation of Australian motorists. By 1950, it accounted for about one in every seven new car sales in Australia. The Australian market expanded rapidly after the war. According to the Commonwealth Bureau of Census and Statistics, new car and truck registrations for the 1950 fiscal year totaled nearly 250,000, a new record. 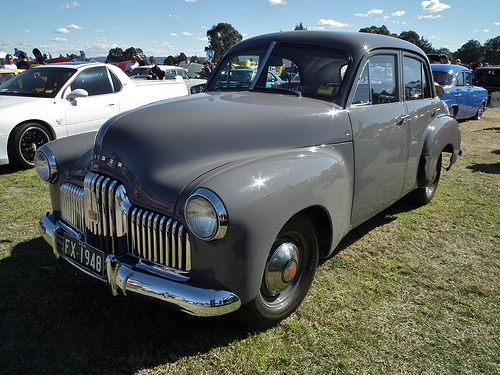 Responding to the increased demand, by the end of 1952, Chrysler, the Nuffield Organization, and Standard-Triumph had all established their own Australian assembly plants. The added competition took its toll on Ford’s market share, but it did little to slow the growth of GM-Holden, which by decade’s end would control more than half the Australian market. The Holden 48/215 and its successors, the FJ and FE, were not GM-Holden’s only products during this era, but much of the company’s strength came from the Holden’s status as “Australia’s Own Car.” Aside from its obvious nationalist appeal, local manufacture had definite economic advantages; a six-cylinder Ford Zephyr, for example, cost around 10% more than a comparable Holden. To seriously challenge Holden’s dominance, rivals would need ‘dinkum’ Australian cars of their own. I am a Holden man, but it is wonderful that the Australian Falcon story is shared. I just hope that the next Falcon will not be a Taurus, the Aussie Falcon just always needs to be rear wheel drive. By the way I absolutely adore your articles! Nice work on the Australian Falcon piece so far. It’s unusual and refreshing to read about the topic from the perspective of someone from outside of the Australian car culture who can take an informed look through a non-partisan lens, and not have their impressions gradually influenced by some 40 plus years of marketing, to say nothing of the schoolyard and BBQ mythologizing. The Futura was a Falcon trim series. It was introduced in the U.S. midway through the 1961 model year, initially priced $248 above than the base model. The Futura included bucket seats, vinyl upholstery, and a center console with a storage bin. It had a slightly different roofline and different wheel covers than other two-door Falcon sedans, but it was otherwise mechanically identical. In 1961 and 1962, the Futura was available only as a two-door sedan. In 1963, the Falcon Futura became a model, available in several different body styles. A Futura model was added to the Australian line with the XL Falcon. It was similar but not quite identical to the U.S. version; the initial XL Falcon Futura was available only as a four-door sedan, although a two-door hardtop was added with the XM line. I have a decent set of photos of a ’62 North American Futura, which you can see on the Ate Up With Motor Flickr page. So great to have you back! Just a quick trouble note, the end of page 5 after the Amazon ads is cut off on the right, including the commenting application (in Firefox 3.6.13), 1680×1050. Oops, a big block of text in the bibliography was messing with the border. It’s fixed for Firefox; IE and Opera are proving more difficult. Excellent article, Aaron… as a Falcon lover in the US I’ve always been curious about the Aussie Falcons (as well as those built and sold by Ford in other markets around the world) and your article has answered a number of questions that I had about them. Looking forward to the next installment! Thank you for the many excellent articles you have here! This is far and away my favorite automotive website, your writing and research are exceptional! Very good article and for someone not conversant with Aussie cars well researched Did anyone show you a pic of what Ford OZ wanted to do to the Zephyr god it was awful no surprise they got turned down. Having had experience of both the Zephyr was a better car. Looking forward to the next instalment. Alas, I was not able to get a picture of the stillborn Zephyr Mark IIA (I did ask Ford Archives). Someone published some drawings in a hotrod mag once puporting to be Ford OZs ideas not a pretty car and Ford England wasnt changing their car to suit anyone even a tiny market like Aussie, they took the Falcon NZ got both but the Zephyr was much more popular especially the MK3 which was English motor way capable the Zodiac could hit 100mph yer needed a long downhill run in a Falcon to do that Ford solved that problem in OZ by turning the Zcar line off. Truly enjoyed reading stories of your Falcon. We in Argentina had similar development issues for the first 60s models since our roads were very rugged too. In the 70s we parted ways when local designers coyed with specific preferences dictated by the respective markets. My only Australian Falcon experience happened when I saw an 80s Aussie Falcon roaming the streets of Buenos Aires quite a few times. It very much looked like an early european Ford Granada. The car had local plates and was obviously RHD. I presume it was brought in by a member of the Australian Embassy, thus circumventing local laws. In Argentina we miss our Falcon but there is no market yet for a Segment D car. These days we build the Focus instead and Argentinians still hold the Ford brand very dear for the successful subsequent Falcon models built and for the fact that they built the first automotive plant in the country back in 1913. I would like to add a small but significant tidbit. Australian Design Rules mandated the taillamps to contain amber-coloured turn signal and red-coloured brake signal and night illumination. That requirement was introduced on the 1963 model year. That required some design changes to the taillamps on the Australian models thereafter. Just a note about the ford 351cu V8 engines. The 351 cleveland engine has a shorter deck height (9.2inch) than the 351 windsor engine (9.5inch) it replaced. Its slightly wider and heavier than a windsor, but not as tall. All the XW/XY GT motors were imported from the US, local engine production didn’t occur until the early to mid 1970s. Yup — the information I found says that the locally manufactured (H block) Cleveland was phased in on non-GT Falcons in mid-1972, and replaced the imported D block engines in GTs from the end of 1973. Great research and a really interesting read. Can anyone confirm the story that Ford Australia sold off their XK, XP dies to Ford Argentina? The Falcon was produced there till 1992, and it was basically an XK shell that was updated. The Ranchero (ute) uses short doors like the Aussie version, and the Rural (wagon) seems to have the short rear overhang of the Aussie wagon, but I stumbled on this great article looking to answer this question, so maybe one of the many Ford Falcon readers will know. Thanks, Scott. Dear Scott, XK dies were brought from the USA in 1963 for import substitution. However, I don’t know the case for the Ranchero and Rural (SW or Estate) versions. Great work on the site, the depth of the content is impressive. Just a quick correction. Page 3 of this article refers to “Chrysler’s AP5 Valiant, which offered an optional V8 engine”. The AP5 only had the slant six engine. The V8 was first made available in the AP6. Thanks, Stuart! That was a typo — I fixed it in the text. Nevertheless, all five cars survived the brutal treatment, maintaining an average speed of 71.3 mph (144.8 km/h). Great article and site, regards from an Australian reader! Whoops — that was pre-metricization, so it was 71.3 mph, which is 114.746 km/h. I’ll fix that in the text. Thanks!